The fescue and/or bluegrass lawn that is so prevalent in Henrico is reliably winter hardy. However, while well adapted to winter, these cool season turf varieties may be injured in cold weather. There are a number of things that you can do and also not do to minimize the risk of winter turf damage. Proper Fall Fertilizer: Did you fertilize correctly in the fall? In Henrico, the last date to apply fertilizer is the end of November. Fertilization during the winter period leads to higher potential leaching and runoff risk of the nutrients. Final Cut: The final cut of the season should be on the lower recommendation for height for fescue or bluegrass. That would make your final cut of the year at 3” height. This keeps your grass from getting too tall and having those tall blades that flop over on itself which can promote diseases. After your final mowing, put you lawn mower to rest for the winter by having the blade sharpened and performing a tune-up. Stay off Frozen Turf: Trafficking on frost or ice-covered turf usually results in extensive physical “breaking” of the leaves. The xylem and phloem tissues that are involved in moving water, nutrients, and carbohydrates around in the plant are usually severed when traffic is applied to ice-covered foliage. The damaged turf leaf blades don’t fall away completely from the stem, but instead slowly turn brown and die. So follow the practice of golf courses and stay off frost covered or frozen turf. It is OK to go on turf covered by snow. The snow will help cushion and protect the blade from damage as well as protect it from extreme cold. 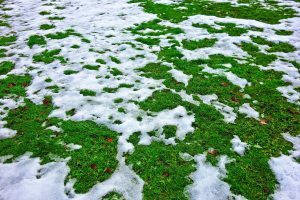 Stay off Overly Saturated Turf: Winter rains or melting snow can make your lawn saturated with water. When this happens, stay off the turf to avoid compaction. Remember that you just aerated the lawn in the fall to improve compaction in the lawn; do not undo that work now by walking over overly saturated turf.